All the problems of the mind...can you do something about them? Listen to this guide for solutions and answers. Phobias are real, and they can turn an individual into an irrational patient if not handled well. Safe and effective methods to counter these extreme feelings of fear need to be assessed and put into practice if we are to fight the problems related to it and protect the victims involved. Depression is a serious condition, and a manic depression takes it even a step further. It would be better to comprehend what you or a loved one is going through than to remain in the dark and not know what to do. Tourette’s syndrome is inherited from ancestors, or so they say, but in a way, those who have it can still overcome or deal with the tics they have. In this audiobook, you will find historical anecdotes, medical and genetic explanations and causes, diagnoses, and symptoms. Not only that, but you will also dig deeper into the sociological and cultural aspects that contribute to the symptoms of Tourette’s syndrome and understand how to manage those. An in-depth, scientific outline and wealth of information awaits you in this comprehensible guide. Become familiar with the effects and causes of hallucinations and know what to do when they occur, either in your own life or someone else’s. This audiobook is only for those who believe that with the right knowledge and motivation, they can achieve anything. This guide helps you understand the rare disorder or condition that people sometimes have: bulimia. The root causes, most important psychological origins, signs, and symptoms are revealed in this comprehensive synopsis. People can get brain tumors for no particular reason, but did you know there are prevention methods that decrease the chances of getting a tumor? Did you know there are methods that help speed up the healing process? Aphasia can happen to anyone. It’s serious, and it’s tough when you are confronted with it. But did you know there are also ways to avoid aphasia? Did you know there are different types of aphasia? It depends on the type whether or not you can do something about it. Panic attacks, anxiety, and all kinds of other symptoms are triggered by the amygdala. You might have been misinformed about anorexia, or people don’t acknowledge your pain. You may have come in contact with people who are judgmental. Well, no longer. You will figure out the truth by hearing about everything you need to know about it. Add this audiobook to your cart. I love informational books like this. A little outside the box, not the typical book topics you'd expect. But it definitely makes you think. The human brain is complex, so this is a good read/listen to book. This book contains all that I wanted to know. I think you can learn a lot about the anatomy of the human brain from these books. Not just from the Bulimia, Brain Tumor, or Hallucinations books (the things that go wrong), but also from the Manic Depression and the Mental Toughness. Learning what happens in the amygdala is as important as learning more about the frontal cortex. Everyone should know more about these things. With getting 1 credit per month, I am glad I can spend it on a 25 dollar book that lasts for about 10 hours. I think I saw these individuals books in the audible store too, but ended up calculating how much it would cost to buy all those things individually. Some of the books are about disorders, like Tourette's Syndrome, Anorexia, or Aphasia. Since I don't have those disorders myself, the most important insights were those of understanding how the mind works and what can be wrong with it, as to comprehend and empathize with those who DO suffer from these things. Aside from that, it's easier to recognize too, so that's a plus. The books Amygdala, Phobias, and Emotional Resilience were genius. I loved them so much that I would recommend them to everyone. Those books give you an emotional boost, help you understand yourself better, and create some emotional toughness with the power of words. Listened to it, liked it, so now I am leaving a short review. You can take a lot of information from this book. Various topics. Very nice. This guide is awesome. I haven't seen many books like this on audible, well... one other one by the same author and narrator. Great content. Keep it up! I truly found some joy (listen to me pulling out the difficult words) in listening to this brain training book. I learned a lot that I didn't already know, so in that aspect, it was totally worth my time and my credit. Recommended. This was a very helpful book. Good value for my credit to get 10 hours worth of content about the brain. Nice book. Thanks. Apart from all the conditions, this book is a great way to get to know the human brain more and become a more educated, intelligent human being. 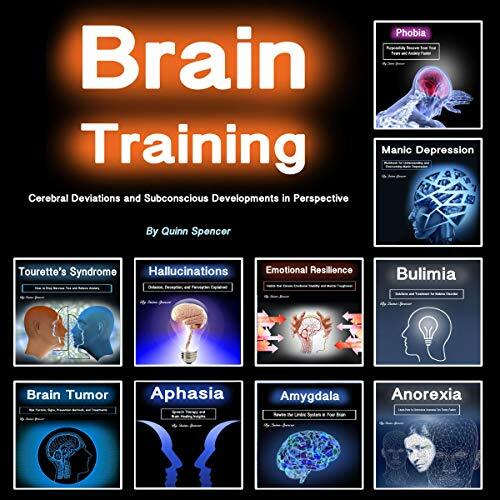 This is an incredible compilation of various brainy books. I've seen other books from this author, and I like him. He points out a lot of facts I didn't know before. To learn more about these conditions and techniques of the human brain was one of my dreams. This is a long box set I recommend to anyone. Putting a lot of subtopic books together may not seem like good idea at first glance, but I actually enjoyed it because it kept me being attentive. When people go on and on about the same thing, I lose my focus. But this one switched quickly and just gave the most important gems of information about each topic, and that's what I liked about it. Yep, that's the title of the book. Not every one of these box set books is focused on that particular theme. But they're all related to it in some way. So I enjoyed listening to this content. The content is great, the narrator is great. There is nothing bad about this book. No complaints. Nothing negative. There, I said it. This is an extensive guide anyone will enjoy listening to. Eric Boozer is a great narrator, and the topics are nothing short of intriguiging.